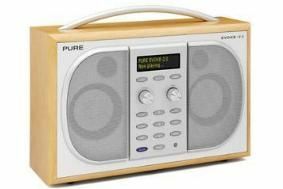 SHOW EXCLUSIVE: Pure to launch Evoke-2S DAB radio at What Hi-Fi? Sound and Vision Show | What Hi-Fi? The Evoke-2S is an evolution of the 2005 Award-winning Evoke-2XT and becomes Pure's flagship stereo DAB/FM radio. It has a host of audio, cosmetic and functional improvements, including Pure's new Clearsound technology. Clearsound is an audio sub-system that uses an integrated, high performance switch-mode power supply, Class D amplifiers, digital audio shaping technology and custom-tuned speakers to provide "clear, dynamic audio" and 30W RMS power. The Evoke-2S includes ReVu to pause and rewind live DAB radio, Intellitext and textScan, improved alarms and sleep timer functions. It also has an OLED (organic LED display) with manual and automatic brightness controls, an input for an iPod/MP3 player, USB upgradability and real maple veneer casework. The radio can be run off the mains or taken out and about if fitted with Pure's optional ChargePAK rechargeable battery. There's a mains power switch on the back for those who don't want to leave their radio on standby. You'll be able to buy the Evoke-2S from November. Pure is also planning to unveil two more new models exclusively at our show: the luxury Evoke Mio portable DAB radio, and the Avanti Flow iPod dock with DAB and internet radio. We'll bring you exclusive details of both models here on whathifi.com later this week, and you'll be able to see them at the What Hi-Fi? Sound and Vision Show, which opens at ExCel in London on Friday, October 31st and runs until Sunday, November 2nd.